green tea: Hurry Up, Spring! Kay, I know three inch cork wedge heels aren't going to carry me through the ice, sleet and snow. And it will be a lo-o-o-ong wait 'til open-toe shoe weather. But I couldn't resist the cuteness or the cheapness! What's getting you through the last dregs of winter? 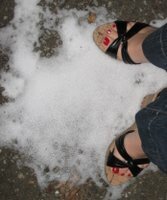 I was so happy to take my sandals when I was on my vacation in Malaysia! Even here in Japan you can't wear them yet!!! don't think I should bring them in April eh? hey let me know if you are free sometime while I'm there! it is 5-7 degrees in the SF bay area, and raining. what is pulling me through is the personal drive to get from here to there.